I think Donna Hay might be a food magician. Every recipe she presents is so pretty and seems so doable, and every time I make one of her dishes, it turns out great and never presents a problem. I cut several recipes from an issue of her magazine a few months ago, and when I look back through them I want to drop everything and start cooking. 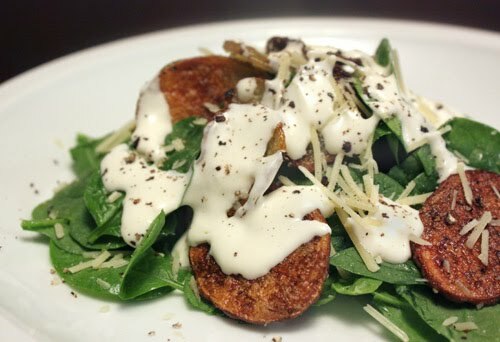 For instance, this salad was a simple mix of fresh spinach, crispy potato slices, and parmesan cheese. That was already a delicious mix of things, but all of that was topped with a creamy lemon dressing. It’s such a simple mix but so good all together. Kurt was thrilled with the crispness of the potatoes. He was sure they were going to become soggy once tossed with the spinach and topped with dressing. They didn’t become soggy at all. The salad really was pretty much perfect in every way. To start, the potatoes should be thinly sliced, tossed with olive oil and celery salt, and then spread on a baking sheet. I used little yukon gold potatoes and sliced them on a Benriner. The slices were roasted for about 30 minutes total, and I turned them at the halfway point. Let the potatoes cool before combining them with spinach leaves and shredded parmesan. The creamy lemon dressing was made from sour cream, mayonnaise, and lemon juice. To keep the potatoes crisp, wait to drizzle the salad with the dressing after it’s on the plate. I have to say: try this salad. The deliciousness to simple to prepare ratio here is unparalleled. We were grilling the night I made this. It was served as a side dish for my chicken and Kurt’s steak, and my chicken was far less interesting than this salad. Even the leftovers, in which the potatoes had finally become just a tad soggy, were a delight to have for lunch the next day. I should have made more because I wanted it for lunch again the day after that. That salad is so unique!! Great Photo! Crispy potatoes with parmesan and spinach and a lemony dressing? I think that would be pretty hard to beat - consider it bookmarked! any salad including a carb is fine with me! looks great. A carb is a good thing in all of its forms, and if it must come in a salad, that's even better. Love the sound of this with greens and the dressing. I love the dressing that's used in this salad, perfect match with the crispy potatoes! Oh wow, this does look amazing. I am going to have to try that recipe. Lot's of people rave about her. This salad looks heavenly. Do you subscribe to Donna Hay's magazine? I am not that familiar with her...I hear she is the Barefoot Contessa of Australia! I want to make this salad. Crispy is good. Crispy in a salad is even better. Yummy!! i totally agree about donna hay. this salad does look quite nice. I love the crispiness of the potatoes here! that crispy potatoes! I MUST get some potatoes, NOW. I've been neglecting them too long! Oh noooo I'll never get these off my mind now! Sounds perfect to me!! I love everything about this salad! I also think Donna Hay's magazines are fantastic, fab pictures too. Those crispy potatoes look awesome! I love the idea of a crispy potato salad! Yum - looks heavenly!! Definitely a must-try! Terrific! That salad look so scrumptious! That is a wonderful idea. Loved the whole concept! Thanks! A clever way to serve potato salad! Looks pretty tempting! I so agree with you on Donna's recipes! Apart from the fact that I love the photography and it seriously makes me drool, the recipes itself are just great and tend to work every single time! Wow, I really love everything about this salad! It looks amazing! This looks excellent! So different from the traditional potato salad. I bet the lemon dressing would be good on other things. That's right up my alley! Love the lemon dressing. What a creative salad. The crispy potatoes and the lemon dressing really bring this salad to a new level. I have a Donna Hay cookbook and it appears that I need to pay more attention to her recipes. I just bought my first Donna Hay magazine as everyone has been talking about her lately and everything does look so winderful. This potato salad is perfect! 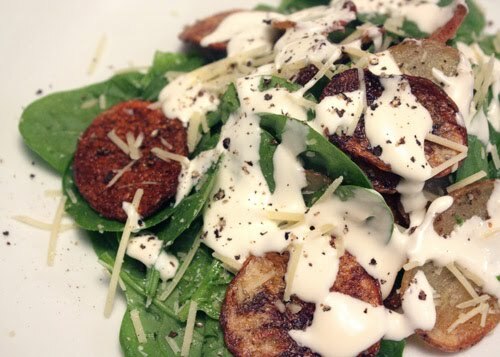 Love the crispy potatoes and with parmesan AND that amazing sounding dressing - this could be a meal in itself! this sounds so yummy and so perfectly simple. Made it last night.... what a winner this salad is! Changed the dressing slightly, will have to blog about it soon! What a brilliant idea. Love it Lisa; it's very very interesting. You are the kind of cook that when you say try something I perk right up. This looks just awesome.